I ended up converting the pumpkin pie recipe in Nourishing Traditions by Sally Fallon using coconut cream concentrate and beef gelatin. I also used the coconut crust from Nourishing Traditions and it works great. I hope those of you with egg and nut allergies will enjoy this treat this holiday season. Enjoy! This pumpkin pie is great for anyone with allergies to eggs and nuts. 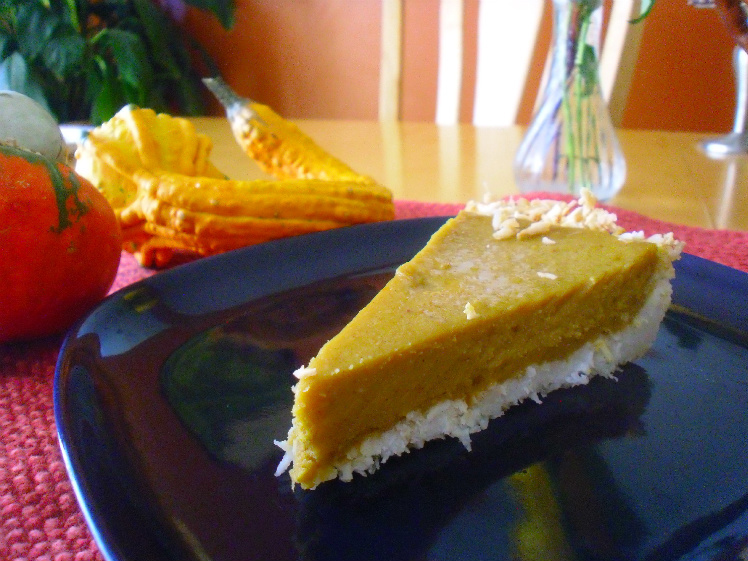 Enjoy with the Coconut Pie Crust for nut, grain and gluten-free. 1. Preheat oven to 325 F. Line a 9 inch pie pan with your choice of gluten and nut-free pie crust. 2. Combine the coconut cream concentrate and 1 cup water in a small saucepan and heat over low-medium heat. Heat and stir until coconut has melted into the water. Remove from heat. 3. Combine the pumpkin, honey, coconut cream mixture, spices and salt together in a mixing bowl. 4. Add the gelatin to a small bowl and add the cold water to it. Stir well. Add the boiling water and stir until clear. Add this to the pumpkin mixture. Stir well. 5. Pour the pumpkin mixture into the pie crust. To avoid the crust getting burned, cover edges of pie pan with strips of aluminum foil until they just cover the edges of the crust. 6. Bake at 325 degrees F for 60 minutes or until firm and the edges of the pie crust are slightly browned. 7. Allow to cool for several hours or overnight in the fridge. It will become more firm as it cools. If you are using the coconut crust, the crust will also firm up overnight in the fridge. Good brands of gelatin include Bernard and Jenson and Great Lakes. Both are MSG-free and grass-fed. Other brands of coconut cream concentrate include Artisana, Nutiva and Tropical Traditions. This recipe is from Nourishing Traditions by Sally Fallon. It is a great pie crust for people who cannot eat nuts. When it first comes out of the oven, it will be delicate and flaky. After it sits in the fridge overnight, it will get firm and more like a coconut cookie. It goes really well with the pumpkin pie recipe. Enjoy! 1. Mix the coconut with the butter or oil in a small bowl. Transfer to a buttered or oiled 9-inch pie pan and press firmly and evenly against the bottom and sides. Because the coconut is delicate, you will have to gently move the mixture up the sides of the pie pan until it is evenly covered. 2. For pumpkin or pecan pie, add the filling and then bake according to recipe directions. This pie crust can also be baked by itself for 30 minutes at 300 degrees and then used with filling that does not need to be baked, such as a Coconut Cream Pie or Berry Pie. Our Holiday Bonus Days will be starting this week: Saturday November 17 – Wednesday November 21. 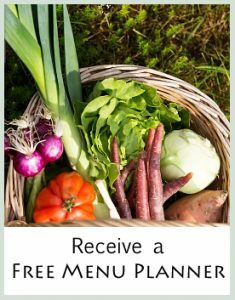 * What does free mean when these menu planners are already available on the membership site? Each month as a member you receive 56 recipe credits to print out your menu planners of choice. When you sign up as a member during the Bonus Days, you will receive the above bonuses as PDF attachments in an email. This leaves your recipe credits for you to use on other menu planners. Let me know if you have any questions or comments about the menu planners or the bonus days. You can also read more about the membership site here. Thanksgiving Menu Planner Give-Away at GAPS Diet Journey.com! You can enter to win one of my Thanksgiving Menu planners this week during the Give-Away that Starlene Stewart is hosting at http://gapsdietjourney.com. It will end Friday November 16th at 12:01am. Good luck! 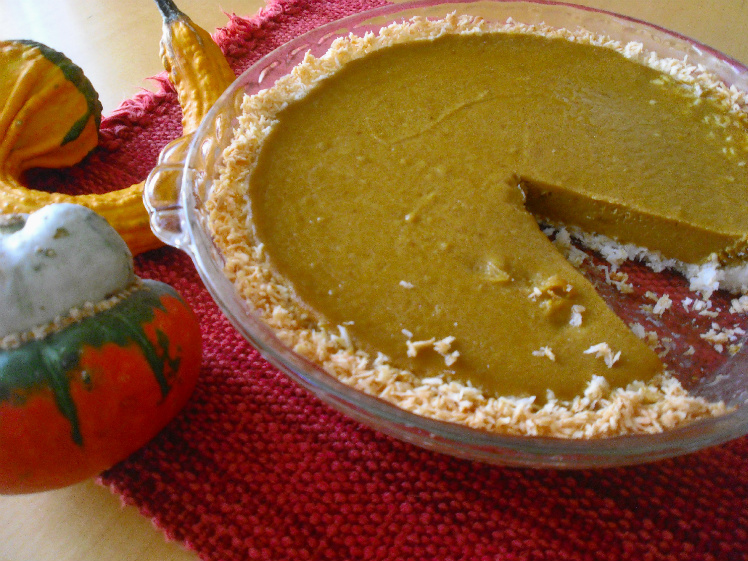 I have been experimenting with egg free pumpkin pies with no success…I am eager to try this! Pinned! You’re welcome Starlene! And thanks for hosting the give-away! Just about to do a post about the new egg and nut free menu planner. Thanks for pinning it! I hope you enjoy it. It worked out well for us and has a great flavor. Enjoy! of the 5 egg free fillings i tested yesterday, this was my favorite! It has such a lovely flavor and texture. we aren’t doing gaps, so I subbed maple syrup and added 2 teaspoons vanilla, and only the cinnamon. Thank you for such a fresh tasting pie, I love it!! thanks so much for letting me know! We really enjoyed it too. What kind of crust did you use? That is pretty much the same thing – but there are different sizes of the coconut. The large flakes will probably not work because they are too big to really stick together. It needs to be the smaller grated coconut for the crust but you could use the medium grind probably. But yes – stick with unsweetened.